U.S. Sen. Jay Rockefeller of West Virginia visited the Challenger Learning Center Saturday, working with Wheeling-area fourth-graders taking part in a mission before hosting a roundtable discussion among Wheeling Jesuit University staff and students as well as staff at the Center for Educational Technologies, which hosted the event. Rockefeller's visit was timed to discuss how the new America COMPETES Reauthorization Law—and science, technology, engineering and math (STEM) education—helps prepare students, improves West Virginia's economic future, and increases innovation. Rockefeller said projections from the Bureau of Labor Statistics indicate that more than 80 percent of the fastest growing occupations depend on knowledge of mathematics and science, and those jobs typically pay 86 percent higher wages than other careers. The America COMPETES Reauthorization Law makes improvements to math and science education and strengthens the nation's commitment to scientific research, he added. Rockefeller chairs the Senate Commerce, Science, and Transportation Committee. After touring the Challenger Learning Center and watching the fourth-graders participating in the mock space mission, Rockefeller headed the roundtable discussion. He said he wants the children of West Virginia to be excited about learning, and Challenger is an example of that. Jackie Shia, director of the Challenger Learning Center, explained how students throughout the world are able to participate in the exciting missions offered at Challenger through the e-Missions™ program. Using videoconferencing technology, these distance learning missions connect students regardless of location with the Challenger Learning Center and give them the opportunity to experience a simulated mission like those offered in person at the center. 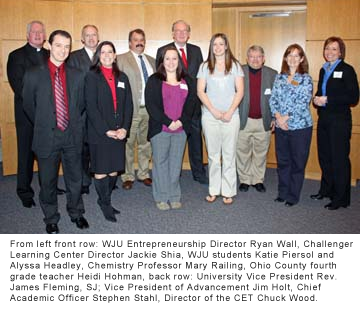 Chuck Wood, director of the Center for Educational Technologies, also took part in the roundtable discsussion.